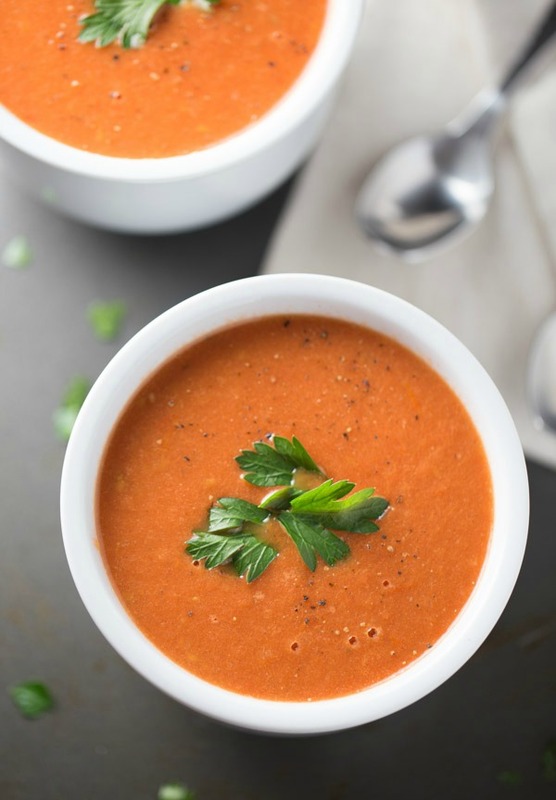 Today we’re going to jump into bowls of Roasted Tomato Soup. Before we talk about this roasted tomato soup, I have to tell you about the epic mess I made in my kitchen while making this soup. Sometimes I don’t think before I do things in the kitchen. Sometimes I don’t do things carefully while in the kitchen. Just ask Ken – he says I don’t wash the dishes carefully because sometimes he finds food stuck on them. I blame it on the dishwasher because the dishwasher does most of my dirty work. And then I tell Ken to wash them himself if he doesn’t like the way they are cleaned. Teehee! 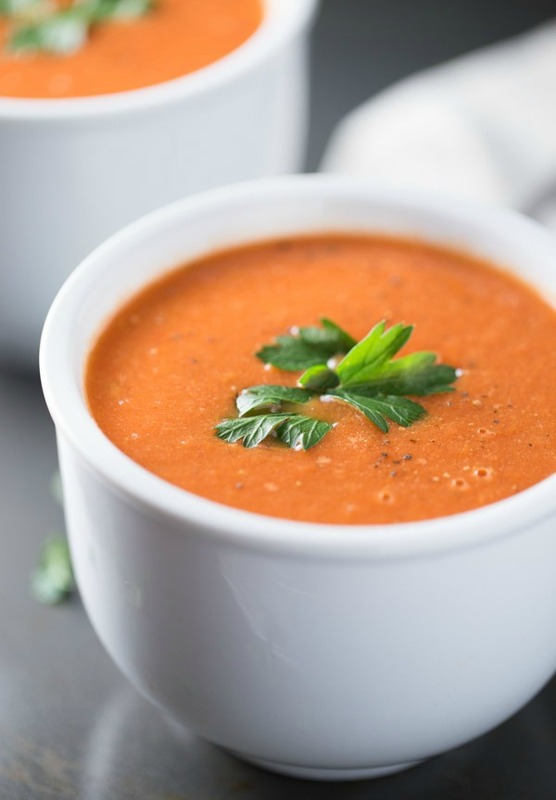 So if my kitchen walls, ceiling and cabinets could talk, they would tell you about the night they received a nice dousing of roasted tomato soup. My arm would also tell you that on that same night, it was burned by roasted tomato soup. In an attempt to cut back on time, I decided to use a blender instead of an immersion blender to blend said tomato soup. I did not wait for the soup to cool. I just spooned ALL of it into my blender. I put the lid on the blender and then hit pulse. HOLY CRAP! and other expletives. The pressure from the heat cause the lid of the blender to loosen and tomato soup exploded all over my kitchen and all over my arm. No joke, there was soup splattered on my roof, my cabinets, my floors and 10 feet away into my dining room. My kitchen could have been used in a scene of a horror movie. My arm was bursting with pain. My dog was going to town, licking the tomato soup off the floor. JACKPOT! True story – my dog loves tomatoes so this was the best thing ever next to being given fresh tomato treats. It took me a while to clean up that mess. I adapted this recipe from the Williams Sonoma Good For You cookbook. I basically followed the recipe exactly but I used a different method for roasting the tomatoes and I added some half and half for an extra boost of creaminess without adding a ton of calories. The soup is smooth, creamy and pairs well with a grilled cheese sandwich or a light salad. If you prefer a little substance in your soups, you can add some cooked cheese tortellini, macaroni or rice. Simply dipping a crispy grilled cheese sandwich into is is good enough for me. I’ll take it plain, too! 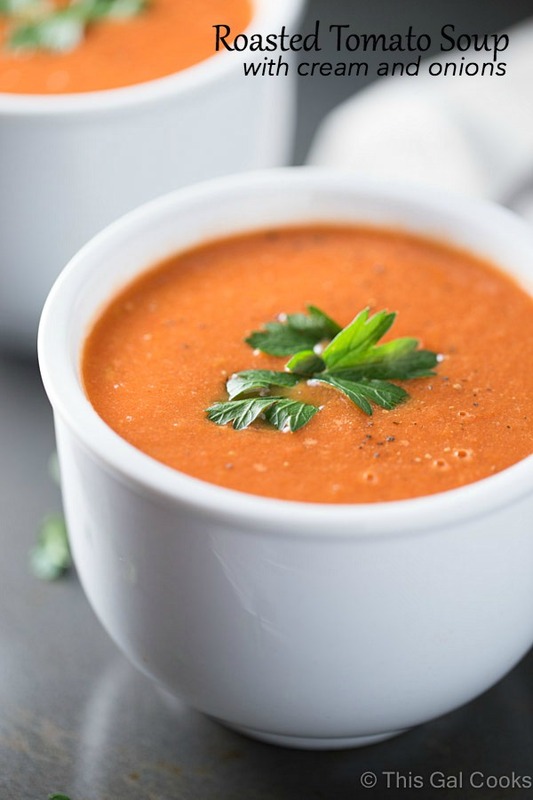 Roasted Tomato Soup is made with fresh roasted tomatoes, onions, thyme and balsamic vinegar. Half and Half is added for a boost of low calorie creaminess! Turn your broiler onto low. Place the rack in your oven 6 inches below the top burner. Halve the tomatoes and placed on a foil lined baking sheet, cut side facing up. Whisk together 1 tbsp olive oil, the balsamic vinegar, ¼ tsp salt and pepper, minced garlic and fresh thyme. Spoon the mixture over the tomato halves. Place the tomatoes in your oven and broil on low for 20-30 minutes or until the tomatoes are soft and slightly wrinkled. Prepare the soup. In a dutch oven or soup pot, heat 1 tbsp olive oil over medium high heat. Add the chopped onion and cook until the onion is tender, about 3 minutes. Add the dry white wine, bring to a boil over medium high heat and cook for about 5 minutes or until the liquid is evaporated. Add the chicken broth and roasted tomatoes to the onion mixture. Bring to a boil and then cover and reduce heat to a simmer. Cook for 10 minutes. Puree the soup with an immersion blender or a blender. If using a blender, be sure to cool for a few minutes before adding the mixture to the blender. Add and puree in batches. Add the half and half and puree for about another 30 seconds, or until creamy. Season with more kosher salt and pepper, to taste. Serve in bowls and garnish with fresh parsley, if desired. Adapted from Williams Sonoma Good For You cookbook by Dana Jacobi. Yikes! Sounds like you went through quite an ordeal with this soup! It looks absolutely delicious, though, so at least you got that covered! :) Tomato soup is one of my favorites, especially when paired with grilled cheese. Pinned! I needed to relax after that mess! Well…the outcome sure looks delish! Tomato soup is a favorite at our house. MMMMmmmm! I have somehow never made tomato soup. I know, how ridiculous is that? This recipe is something I really need to try! This was the first time I ever made it! So easy, minus the huge mess I made. ;) Hope you enjoy the recipe if you give it a try, Tori! It’s so cold outside, this would be a great lunch today! yum! Thanks for sharing. I love a good tomato soup! Me too, Heather! Especially with a good grilled cheese to dip into it. YUM! OH. MY. GAWD. Soup EVERYWHERE! That’s a hilarious kitchen fiasco, Julie! Though I’m sure it wasn’t at the time! I will bear that in mind when I make this! It looks fabulous! I love tomato soup and ALL soup basically! This looks so rich and creamy! Oh no! I’m so sorry for your arm and for your kitchen! Been there, done that :( Hope you’re feeling better soon and PS this soup looks incredible!!! Nothing beats a silky, creamy bowl of steamy tomato goodness. Have a great weekend Julie! Thanks Allie! All is well now. But funny – I found a few splatterings of tomato soup while cleaning my kitchen yesterday. I’ll probably be finding it for months. LOL. Hope you’re having a great weekend, Allie! This soup is just beautiful. I love that it looks so creamy! I should not be checking your blog when I haven’t had lunch… Now I’m starving! Haha, kind of like one shouldn’t go grocery shopping on an empty stomach, right? :) Thanks for stopping by and for the compliments too, Michelle! Sounds like quite a delicious but dangerous mess! 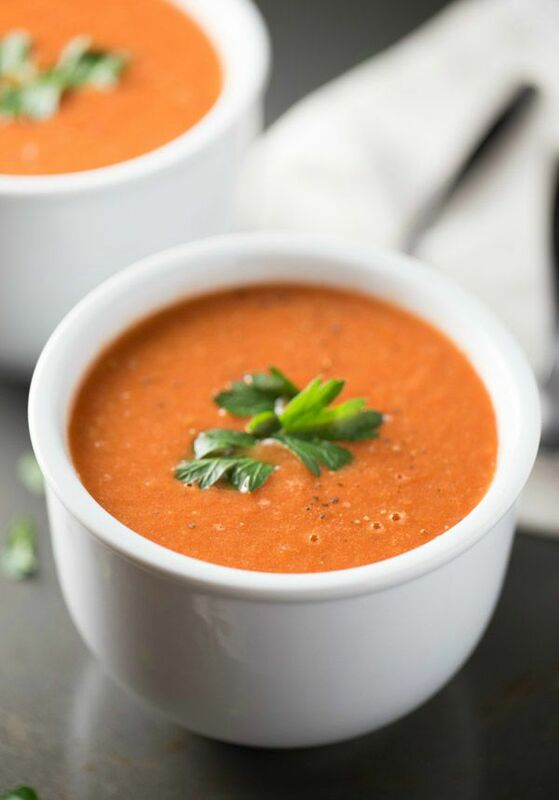 I can imagine it was all worth it though – this roasted tomato soup looks incredibly comforting and delicious. It was totally worth it, Thalia! Glad you like it, Francesca! Thanks Medeja! You should give it a try. I think you’ll love it! I love this soup Julie. Been looking for something like this..pinned!